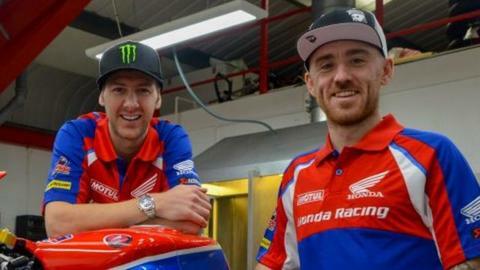 Ian Hutchinson and Lee Johnston will form a new Honda Racing rider line-up at the 2018 North West 200, Isle of Man TT and Ulster Grand Prix road races. Both riders will campaign the Honda Fireblade SP2 in the Superbike and Superstock 1000cc classes. Hutchinson is recovering from serious leg injuries sustained in a crash at the TT in June but will hope to add to his tally of 16 victories at the event. Johnston seeks a first TT win, having won at the North West and Dundrod. Yorkshireman Hutchinson broke his left leg for a third time during this year's Senior TT in a crash at the 27th milestone. The 38-year-old has undergone extensive surgery after fracturing his femur and ankle on the leg he almost lost following a crash at Silverstone in 2010. Since securing a record five successes as part of the Padgett's Honda team in 2010, he has ridden Yamaha, Kawasaki and BMW machinery on the international roads circuits in recent years. Hutchinson won the Superbike and Superstock TT races as part of the Northern Ireland-based Tyco BMW outfit this year. "I'm really looking forward to getting started with Honda Racing - it's a new challenge and a fresh start for me," said the Bingley rider. "I haven't ridden the Fireblade SP2 yet and will have to wait until we go testing early next year, but I can't wait to start making some progress." Johnston's career has been hampered by injuries in recent seasons but the Fermanagh rider will be keen to add to his tally of three wins at both the North West 200 and Ulster GP. Having made his TT Mountain Course debut in 2012, the 28-year-old went on to collect podiums in the Superstock and TT Zero classes in 2015, but crashed in practice this year, ruling him out of the remainder of the meeting. "I am genuinely excited about being with Honda Racing next year, I'm probably the most excited I've been in years if I'm honest," said the Northern Irishman. "I have had two tough years and it's nice to have everything organised and in place early so I have nothing to worry about apart from riding motorbikes. That for me is the biggest thing and what I wanted more than anything."